The Public Local Inquiry on the Beauly to Denny 400kV Electricity Transmission Line began in Perth on Tuesday 6th February. It is expected to run till December of this year. It is addressing the application by Scottish Hydro Electric Transmission Ltd and Scottish Power Transmission Ltd (essentially Scottish and Southern Energy) to build a new 400kV electricity transmission line from Beauly in the north to Denny in the south. The case for this development is based on the perceived need to upgrade the main power transmission line from the Highlands to Lowland Scotland and to the rest of mainland Britain in order to carry power from the many new (and proposed) windfarms proposed for the Highlands. The Project is part of the largest industrial development of the Highlands since the hydro-electric schemes of the mid-20th century, and the 220km of new powerline on pylons, more than 50m tall, will have major implications for Scotland's mountain landscapes. Objections have been lodged by the four local authorities whose areas will be affected - Highland, Perth & Kinross, Stirling and Falkirk Councils and by the Cairngorms National Park Authority as well as by Clackmannan Council, the Beauly-Denny Landscape Group (BDLG). The latter is a banner under which the Association for the Protection of Rural Scotland, John Muir Trust, Mountaineering Council of Scotland, National Trust for Scotland, Ramblers Association Scotland and the Scottish Wild Land Group are participating in this Public Local Inquiry. Objections have also been raised by a number of more locally-based action groups and other interested parties. Not all the objectors are opposed to the line in principle. 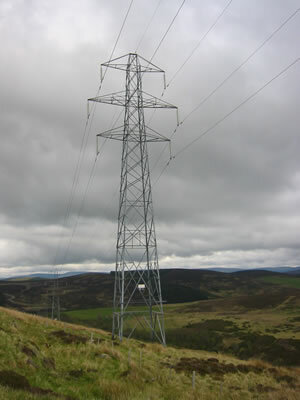 The local authorities, for instance, accept the principle that reinforcement of this aspect of the electricity grid is necessary but are objecting to the specific means proposed by Scottish Hydro Electric Transmission Ltd and Scottish Power Transmission Ltd. Other objectors, in particular the bodies represented by the BDLG, are challenging the need for the line, the economic justification for it and the sustainability of transmitting power hundreds of miles from remote and isolated generators to where it's needed in the centres of population. Early in the Inquiry, the BDLG, Eilean Aigas estate and Highlands Before Pylons lodged legal submissions alleging there were major flaws in Scottish and Southern Energy's case and calling for the Inquiry to be halted. They also argued that the electricity regulator Ofgem had failed in its legal duty to consider the sustainability of the proposed development and the environmental effects of alternatives to the pylon upgrade. However, some three months after the submissions were made, Scottish ministers have so far failed to consider them and decide on their relevance. The delay has been attributed to the elections but the senior reporter to the Inquiry has said that ministers in the new executive would be considering the legal documents "as a priority". The first phase of the Inquiry, the Strategy Session ran for 12 weeks and has recently finished. A series of Local Sessions will then be held between 29th May and the end of this year at Inverness, Newtonmore, Perth and Stirling. A number of witnesses gave evidence on behalf of BDLG in the course of the Strategy Session, addressing the core arguments that the proposed transmission line upgrade will cause unacceptable damage to Scotland's landscapes and is unnecessary to meet carbon reduction targets. The BDLG case also highlighted the inappropriateness of making such a decision on the transmission line in the absence of a National Energy Strategy and challenges economic arguments put forward by the applicants to support their case. Since the Inquiry process will run till the end of the year - unless legal challenges by objectors are successful in bringing it to an end - no decision can be formally taken quickly and scope remains for opponents of the scheme to lobby their elected representatives at Westminster and Holyrood. (While energy policy remains under the control of Westminster, the outcome of planning inquiries is determined by the Scottish Executive.) The official Inquiry site, http://www.beaulydenny.co.uk/, is curiously sanitised and reflects the non-traceable actions of those running the Inquiry. Participating in a Public Inquiry is an expensive process and an appeal for funding has been launched on behalf of BDLG by the Mountaineering Council of Scotland. Whilst not actively participating, substantial financial contributions to this appeal have already been made by NEMT and by the Cairngorm Club. If any of our readers wish to contribute, donations should be sent to David Gibson at MCofS, The Old Granary, West Mill Street, Perth PH1 5QP. Cheques should be made out to The Mountaineering Council of Scotland and an accompanying letter should state that the cheque is a donation for the Beauly-Denny Landscape Group.